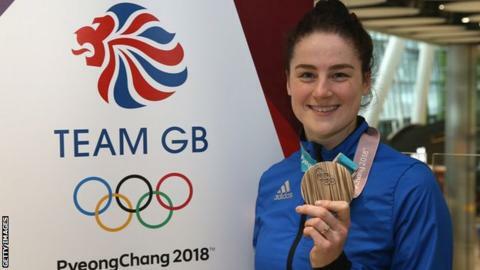 Great Britain's Laura Deas won skeleton World Cup bronze in Canada - her first medal since finishing third at the 2018 Winter Olympics in Pyeongchang. Deas, 30, was seventh after the first run but then recorded the joint quickest time in her second run to take third in Calgary by 0.06 seconds. It is her first World Cup medal for more than three years. "It's great to be back on a podium. I'm pleased to be finding some form as I head towards the Worlds," said Deas. The Welsh slider's next major event is the World Championships in Whistler, Canada, starting on 25 February. "It's been quite a disrupted season for me, missing two races and lots of ice time due to illness and injury," she added. Germany's Tina Hermann took gold in Calgary in 1:57.39, with Canada's Mirela Rahneva 0.13secs behind in second. Deas finished in 1:57.68, just ahead of another home slider, Elisabeh Maier, who registered 1:57.74 to come fourth. It was the last of the season's eight World Cup races and Elena Nikitina became the first Russian to win the overall title.